Malnutrition disproportionally affects seniors, with up to 1 out of every 2 at risk for malnutrition, and disease-associated malnutrition in seniors is estimated to cost $51.3 billion annually. Aligned with our mission to enable seniors to successfully age in place with access to high-quality, affordable health and support services, West Health is partnering with many of the brightest and most innovative leaders in the fields of aging, senior nutrition and healthcare to advance a strategy to provide comprehensive malnutrition care to seniors in their homes and communities where they live and manage their health. In February 2018, West Health hosted a Senior Malnutrition Visioning Session in Washington D.C., which included national leaders in healthcare, aging, senior nutrition, policy and research. Participants engaged in constructive dialogue and exchange of innovative ideas to advance comprehensive malnutrition care and prevention for seniors through practice innovations and community-based solutions. 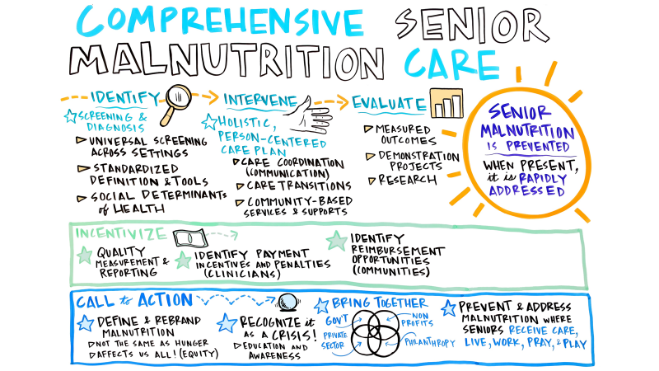 The output of the session was a multi-year roadmap to achieve Comprehensive Senior Malnutrition Care, and reduce the incidence of senior malnutrition to avert an ever-growing threat to successful aging. The roadmap outlines four primary target areas to actualize change.